Contrary to what some people may think, I didn’t just wake up one morning thinking, “Hey. 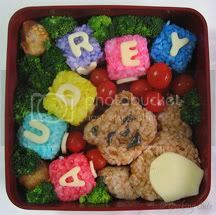 I think I want to prettify my lunch today!” Despite my addiction to anime, manga and J-drama, it never really occurred to be to start preparing bento until I ran into Cooking Cute. At that time, it wasn’t even Cooking Cute yet, but just a livejournal account owned by mmmbento. One of the earliest English-language bento blogs on the net, Cooking Cute showcased more than just pretty, cute bento but ideas, tips and recipes as well. It was a treasure throve of tips and suggestions to get you started on the actual bento planning and packing. It was also crammed full with photos featuring various cute touches which are sure to inspire. Personally, I find it unfortunate that Ngoc, Cooking Cute’s owner hasn’t updated in a while. Last I heard months ago, there was a bun in the oven, so she’s probably busy with being a mom now. Still, despite the lack of updates, Cooking Cute remains a good site for information and inspiration. Remember to check out the recipes, guides and the gallery. All images in this post, except for screenshot, is property of Cooking Cute. 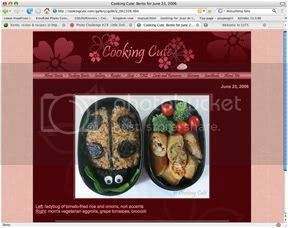 Cooking Cute was actually the very first bento blog that I stumbled on. I had just started dating my boyfriend who has Celiac and I believe that I plugged something like “simple recipes for Celiacs” into a search engine and found Cooking Cute. Wow, so it isn’t just me. Seems like a lot of us had that “Cooking Cute” experience. I also started out looking at her site and I still use it for cooking instructions and such. Her recipes are the best! It’s probably my fav site along with this one and Biggie’s Lunch-in-a-box. So inspiring! And I love the big pictures and details found on all three sites. I miss Cooking Cute! I hope she gets back to making bento soon. On that note, I hope I get back to making bento also hehe. Cooking Cute was also my gate to bento making! I had never guessed that she started so many people out. I also miss her updates, but with all the links to other sites I found on her site, there will never be a shortage of talented fellow bento-ers! Such a pity she doesn’t update anymore. I love how creative she can get. You’re right! Now I remember, she started packing bento because of her hubby’s Celiac condition. I’m sure it was a pleasant discovery, her site, after you were expecting to find just recipes and stuff. I wrote her to ask for permission about using her pics. I hope she responds, more because I’m curious about how she’s doing now. I guess staring at her lunches everyday for more than a year gives me a feeling like I know her already. She’s really converted a whole lot of people. In the early days of the LJ bentolunch community, her stuff really shone through as an inspiration for all us noobs. I think she’s made a very big mark and has contributed a whole lot to helping make bento an international phenomenon. Last summer, I saw cooking cute mentioned in a magazine. I was overtaken by curiosity, so I visited. *cue 2-4 hours of looking through the archives* Afterwards, I thought “I want to do that too…” bookmarked her page, and visited nearly everyday. Now I’m making my own bento, and trying to make them cute. (not always succeeding) Hopefully, when her dumpling is older, she’ll be back, with bento for the kid too! I agree, I hope she starts again someday. I think we all miss her. Oooh that looks like an interesting blog! Thanks for the lead! Hallo! It’s me, Ngoc! I was just checking to see if anyone visits my site anymore and found your post. Warm fuzzy feeling! I would love to get back to bento but just have not been able to find the time yet. Working on it, but my (two!) kiddos make it harder now. I’ve kept the site up hoping that I can get back to it soon. Happy New Year!